Our stationary shelving offers the most economical and space efficient solution for filing and storage needs. Full visibility allows one-touch retrieval. Modular design offers mixed media flexibility and easy reconfiguration when moving to a mobile system or into another area. It provides the highest flexibility for handling different sizes of information. Common applications for stationary shelving includes letter, legal folder, box storage and archival records. 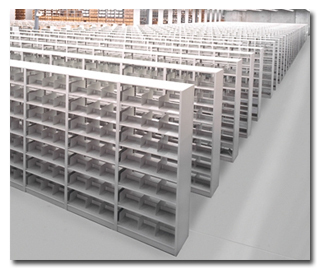 Stationary shelving can be easily added to, relocated, or reconfigured to adapt to any filing and storage application. Click here to view our shelving color selection guide.